Mother’s Day today and most of the family to lunch with me. The all-day rain that had been forecast earlier in the week fell yesterday (very welcome) which was good because it meant that Mum and I could take a look at the garden together, something we always do, whether I’m visiting my parents or they are visiting me. A walk around each other’s garden, always in the company of the gardener, to see what is coming up, doing well or struggling, is a shared ritual. Very often there are plants to be donated; Mum is great at propagating and can get nearly anything to grow – and today she brought me some plants of Ammi majus (think Cow Parsley type flowers – it’s very pretty) that she’d grown from seed. In turn I’ve promised her some Aquilegia, once they have made larger plants and I can tell if they are the purple A.’Miss I H Huish’ or the green A.’Lime Sorbet’; both of which I grew from seed last year. We did not stay out too long, the wind had turned cold again, but it was good to spot the many allium and tulip bulbs I planted last autumn starting to show above ground – I’m hoping for good things from them in May. Digging nearly everything out of the garden last year, in preparation for the new design, gave me a good chance to give more consideration to what I planted and where. I’ve tried, and the coming weeks will tell if I succeeded, to place bulbs by colour, either to give strong contrast or softly compliment each other – but I have a suspicion that nature is going to throw a surprise or two my way. I’ve a sneaking feeling that some very advanced looking tulips are the offspring of some letter-box red tulips that have come up every year without fail; tulips often don’t come back a second season, things eat the bulbs during the summer months or they just put too much energy into flowering the first year, but the red ones – I’ve had them in every garden I’ve owned, whether I put them there or not. Because they give a splash of colour I never have the heart to get rid of them, even if they are in the wrong place, but this year, alongside the carefully selected pinks and purples they might be a contrast too far. We shall see. 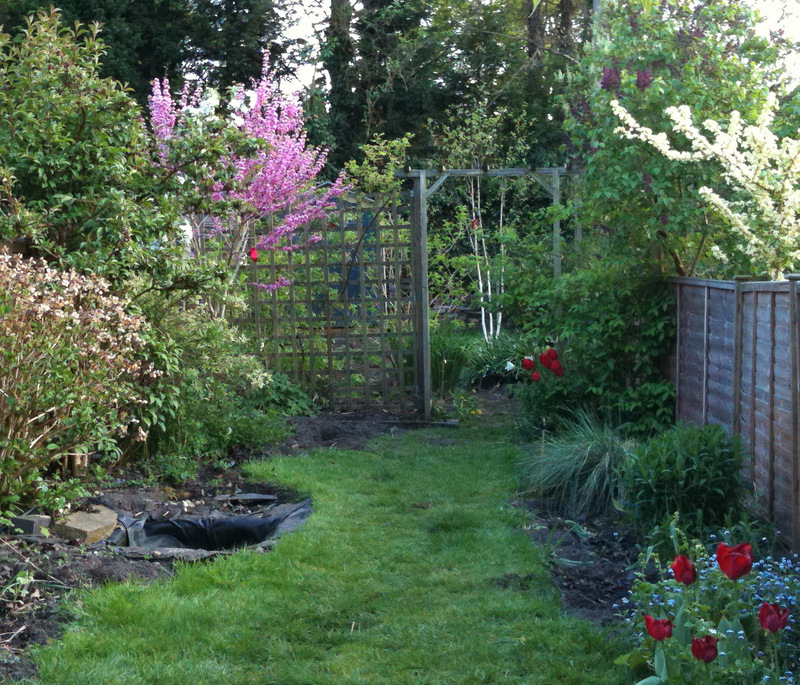 This photo is of my garden taken last April, just before work started – you can see the red tulips. The purple/pink flowering tree is the Cercis siliquastrum I wrote about earlier, and you can see the beautiful white stems of the Silver Birch, or Betula jacquemontii. This entry was posted in In my garden and tagged cow parsley, tulip bulbs. Bookmark the permalink. Ah, love the image of you and your mother doing the rounds. It was a ritual with Ma and me too, from toddler years, if her stories are to be believed! Though I lived away from home for most of my life, we made up for lost time when I moved back home to care for them in their old age, and doing the rounds was a (greatly missed) daily ritual. She had the greenest of thumbs too, with pots of treasured seedlings/cuttings/layerings all over the place. I love that you framed the view off the Birch:) It’s been there ten years, you said? Thanks TWG for the reading & commenting! You asked about my birch, yes it will look a little copse like as it grows, rather than just a single tree. It was a birthday present from my parents not quite three years ago, before the re-design idea had been hatched. Ok – only three years – I was wondering why it was still so small!